Click here for link to audio Episode #27. 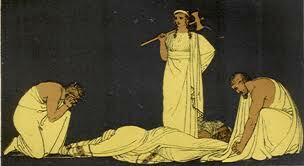 The towering figure of Clytemnestra dwarfs all other infamous gals from the ancient world. 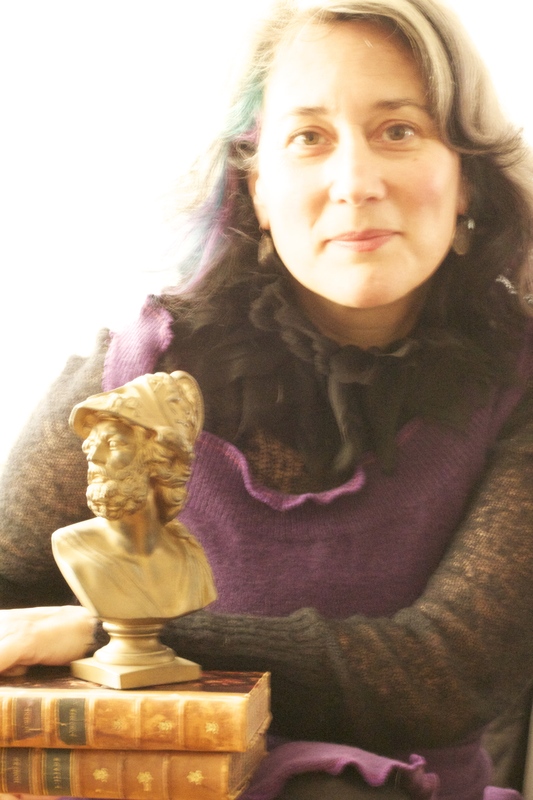 Here she is standing over Agamemnon’s body. What was her beef? She got steamed when Agamemnon sacrificed their daughter so the guys could get a fair wind for Troy all those years ago. 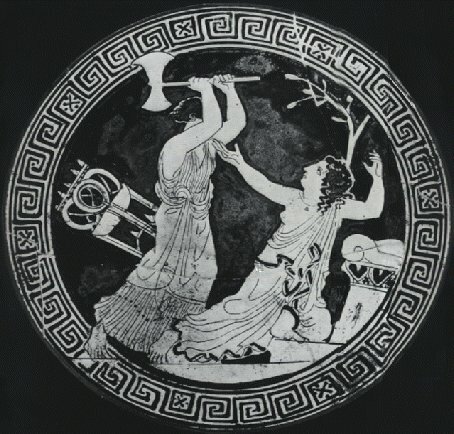 Clytemnestra’s skills with the battle-axe were also the death of the prophetess slave and princess of Troy, Cassandra, as shown below on this piece of pottery. Go back to the ancient tragedians to see the full-on misery of the house of Atreus unfold, or check out the powerful trilogy of films by Michael Cacoyannis, starring the spellbinding Irene Pappas as Electra. Electra (1962) by Michael Cacoyannis. Not to spoil the story or anything, but Electra finally gets hers when she convinces her long-lost brother Orestes to assist her in the plot to avenge their father’s death and murder Agamemnon’s killers! Clytemnestra tries to defend Aegisthus from Orestes, while on the right of this vase Electra’s happy arms welcome the act! 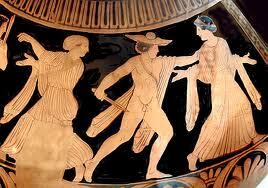 In desperation, Clytemnestra even bares her breast to her son, hoping to dissuade him from killing his own mother. Alas! Puts our modern tabloids to shame. Posted in The Odyssey. Tags: Achilles, Aegisthus, Ancient World Now, Clytemnestra, Electra, Greek, Gwen Bowers, Gwen Minor, Homer, House of Atreus, Mycenae, Odysseus, Orestes, Read-Aloud-Plays:The Iliad The Odyssey and The Aeneid, Richmond Lattimore, The Iliad, The Odyssey, the Underworld. RSS feed for comments on this post.. TrackBack URL.